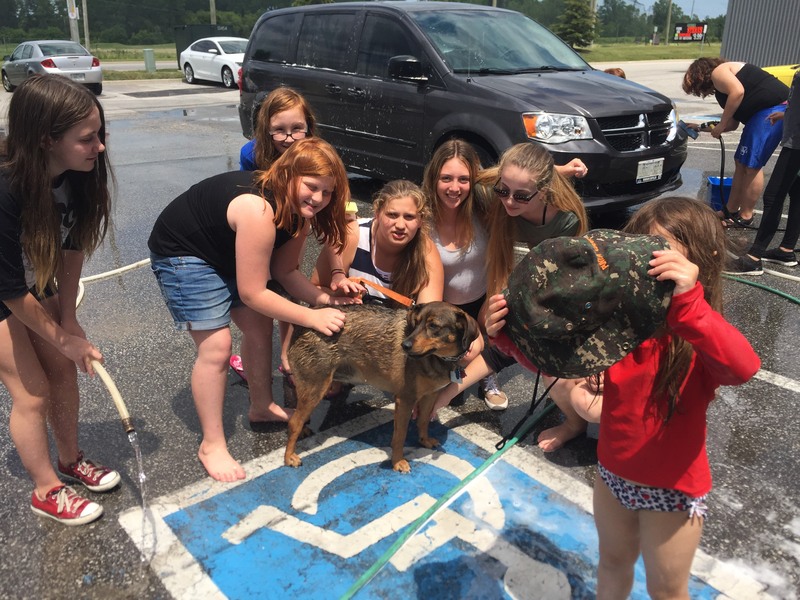 The Fourth Annual RTC Car Wash Fundraiser Raises $600! On Saturday, July 15th, the Riverfrontiers gathered at Sobeys off Manning Road for the fourth year in a row to raise money for our coming season. We would like to extend our thanks to Sobeys for hosting us every summer – it’s not only a helpful fundraiser for us between seasons; it’s also a nice icebreaker getting to know new families that will be joining the group in September. We were busy from the moment we set up, with cars lining up all day for us. We had a fantastic turnout of kids and parents to wash the cars and wave the signs, and we sure appreciated the warm dry weather to work in! We ran the wash from 10 am. to 3 pm., greeting friends, family, and strangers, who all came out to support us and encourage us for our upcoming season. I lost count of the cars, but I know for sure that we only washed one dog! Thanks for coming out, Freeman! At the day’s end, we had raised almost exactly $600 towards our productions of Christmas Around the World, Anne of Green Gables, and Seussical. We’ll have a cast of approximately 65 kids between the ages of six and eighteen this season. We’re still working our way through confirmed registrations and the waiting list, but it’s going to be a big group. We have a big group to teach, to direct, to costume and to stage. Our costs run higher as our group gets bigger, so we’re always on the lookout for sponsorship. If you would like to be part of partnering with Riverfront Theatre Company, please have a look at our Sponsorship Form 15th Season – online version, and don’t hesitate to contact us! Previous: Previous post: Our Stratford Trip is Upon Us! And the Next Season is Already a Hot Topic with the Kids! Next: Next post: Our New Season Starts September 9th!